Further to my last couple of posts, here I examine the relationship between the percentage who believe inequality is the top global threat and a country's position in the global distribution of GDP per capita. 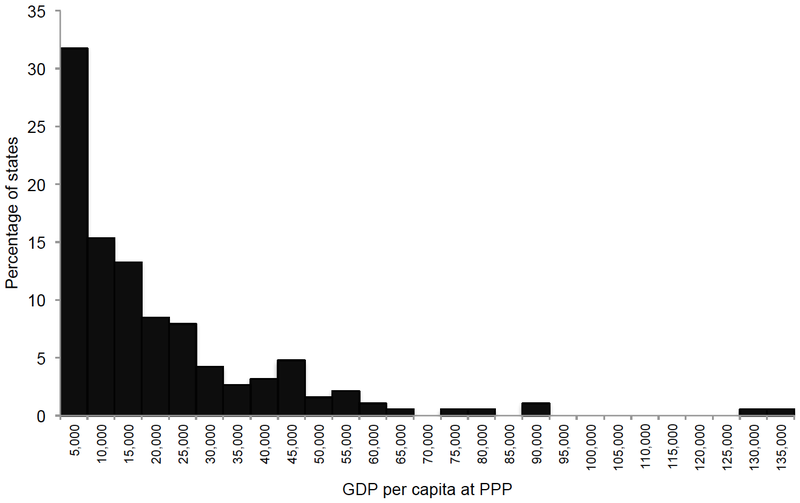 The global distribution of GDP per capita is displayed below; data are for 2012, taken from the World Bank (figures were not available for Palestine or Argentina). Note that the chart displays the distribution of states (loosely defined), rather than countries. For example, the World Bank reports separate values for Hong Kong, Macau and China. The median state is Tunisia, with a GDP per capita of $10,800. Western Europe encompasses the 78th (Portugal) to 99th (Luxembourg) percentiles. The second chart (below) plots the percentage who believe inequality is the top global threat against percentile in the global distribution of GDP per capita. Interestingly, the correlation is moderate and positive, namely r = .48 (p = 0.001, n = 42). Citizens living in richer countries are more likely to believe that inequality is the top global threat. Since about 2/3rds of global income inequality is between countries, this suggests that rich countries might be able to assuage their citizens' concerns by taking measures to reduce their own incomes. They could increase foreign aid to poor countries, or simply destroy productive assets. One possible explanation for why citizens of poorer countries are apparently less likely to believe inequality is the top global threat is that they have access to less information, or to information of lower quality, than their counterparts living in richer countries. In other words, if they had better information, perhaps they would be less concerned about AIDS, and more concerned about inequality. Last week I posted on the blog OpenPop about the relationship between measured inequality and citizens' concern about inequality. That post built upon an earlier post where I had examined the relationship among OECD countries. One measure of concern about inequality that I used in the OpenPop post was the percentage of respondents who view inequality as the top global threat. This measure was taken from a recent Pew survey where respondents in 44 countries were asked, "Which one of these poses the greatest threat to the world? Nuclear weapons; Inequality; Religious & ethnic hatred; Pollution & environment; AIDS & other diseases." I found that measured inequality is weakly but negatively associated with the percentage who believe inequality is the top global threat. As I noted, this probably probably arises because countries with high inequality often face other problems, which citizens may consider more pressing. One such problem is AIDS. To examine whether citizens' concern about AIDS & other diseases is correlated with the measured prevalence of AIDS, I obtained data on the latter from the CIA World Factbook (figures were not available for Palestine or Brazil). Because the distribution was highly skewed, I applied the log transformation. 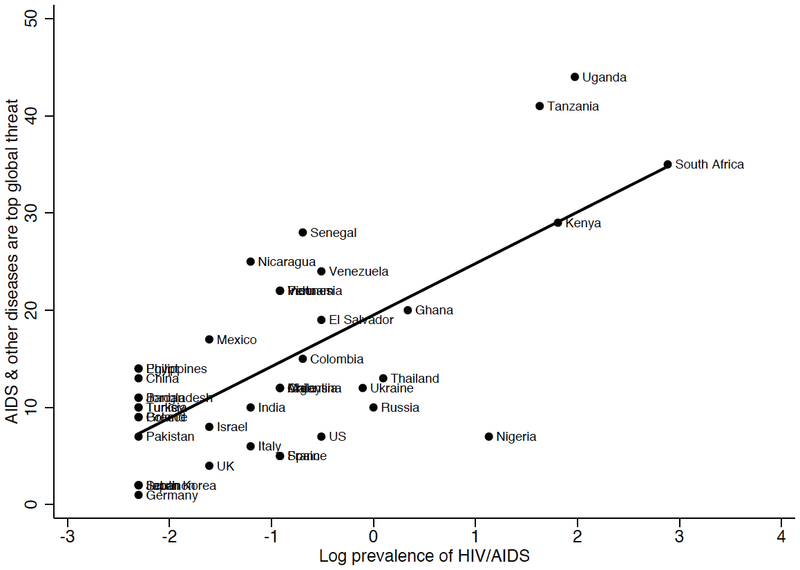 The chart below plots the relationship between the percentage who believe AIDS & other diseases are the top global threat and log prevalence of HIV/AIDS. The correlation is strong and positive, namely r = .70 (p < 0.001, n = 42). In most Western countries, where the prevalence of HIV/AIDS is low, less than 10% of respondents believe AIDS & other diseases are the top global threat. By contrast, in four of the Sub-Saharan African countries, where the prevalence of HIV/AIDS is substantially higher, more than 25% of respondents believe AIDS & other diseases are the top global threat. Nigeria is something of an outlier: despite a relatively high prevalence of HIV/AIDS, few respondents believe AIDS & other diseases are the top global threat. This is attributable to the fact that many Nigerian respondents (38%) view religious & ethnic hatred as the top global threat, most likely due to the ongoing Islamist insurgency there. YouGov have just done another poll on attitudes to offensive speech, this time in the US. As before, the poll unearthed a fairly strong gender difference. 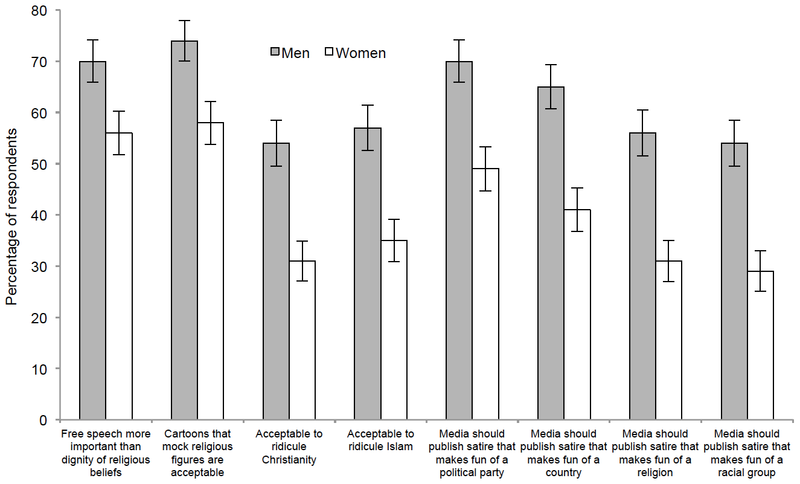 Looking at the chart below, women are uniformly less tolerant of offensive speech than men (14-25 percentage points). Incidentally, part of the difference may be due to a tendency for women to give more socially desirable responses. Yet it is not clear that approval of censoring offensive speech is actually more socially desirable. Without adjusting for social desirability bias, 41-65 percent of the population (depending on the measure) seems to be against censorship, and the percentages are even higher in the upper-income group. The good people at YouGov have just done a poll on attitudes to the Charlie Hebdo cartoons. Their main findings were twofold. 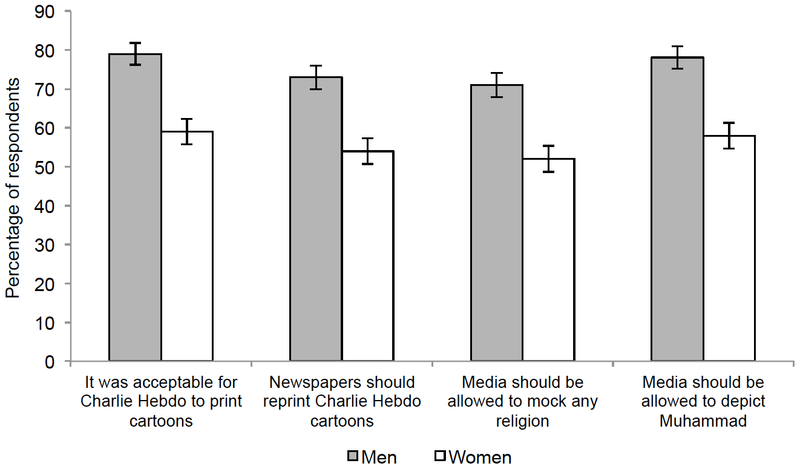 First, a sizeable majority of the British public (69%) believe that it was acceptable for Charlie Hebdo to publish cartoons depicting the prophet Muhammad. And second, a slightly smaller majority of the British public (63%) believe that newspapers should now reprint the Charlie Hebdo cartoons. More interesting than the headline results, however, is the gender difference that the poll unearthed. Previously I have noted that, in the UK, women are much more likely to believe that offensive jokes are unacceptable. Women seem to be less tolerant of offensive speech in the US too. The chart below plots the percentages of male and female respondents (along with 95% confidence intervals, based on unweighted n's) who agreed with each of four statements pertaining to free speech. In all four cases, the male percentage is substantially higher (19-20 percentage points). In an otherwise informative report on South Korea's ageing population, Stephanie Studer of The Economist claims that "South Korea's fertility rate is now the lowest in the developed world at less than 1.3 children per woman". Yet the CIA World Factbook lists at least two developed countries with TFRs lower than South Korea: Taiwan at 1.11, and Singapore at 0.80. This marks the second error pertaining to international comparisons that I've spotted in The Economist. There is a lively, ongoing debate in the blogosphere over the relationship between fiscal austerity and economic performance. Jeff Sachs recently penned an article criticising Paul Krugman's predictions as to the impact of austerity on US economic performance, to which Krugman responded on his blog. In the first of his responses, Krugman presents a chart showing that change in government purchases is strongly associated with GDP growth across country-years for European countries between 2010 and 2013. Austerity measures refer to official actions taken by the government, during a period of adverse economic conditions, to reduce its budget deficit using a combination of spending cuts or tax rises. This means that a year in which government purchases go up is not necessarily one of fiscal austerity: if I understand correctly (please tell me if I don't), it is possible for a government to increases purchases whilst simultaneously reducing the budget deficit; e.g., by cutting transfer payments or raising consumption taxes. An alternative way to examine austerity's impact on economic performance is to simply plot GDP growth between 2010 and 2013 against the average budget deficit over this time period. Using Eurostat (as Krugman does) for budget deficit data, and the World Bank for GDP data, one obtains the scatterplot shown below. The relationship is moderate and positive: r = .44 (p = 0.019). While Greece and Ireland are obvious outliers, their effects on the correlation more-or-less cancel out; after removing them, r = .41 (p = 0.038). This analysis is of course also problematic. Most importantly, the denominator of the budget deficit (namely GDP) will tend to be smaller in countries experiencing slower growth, meaning that the deficit itself will be larger. 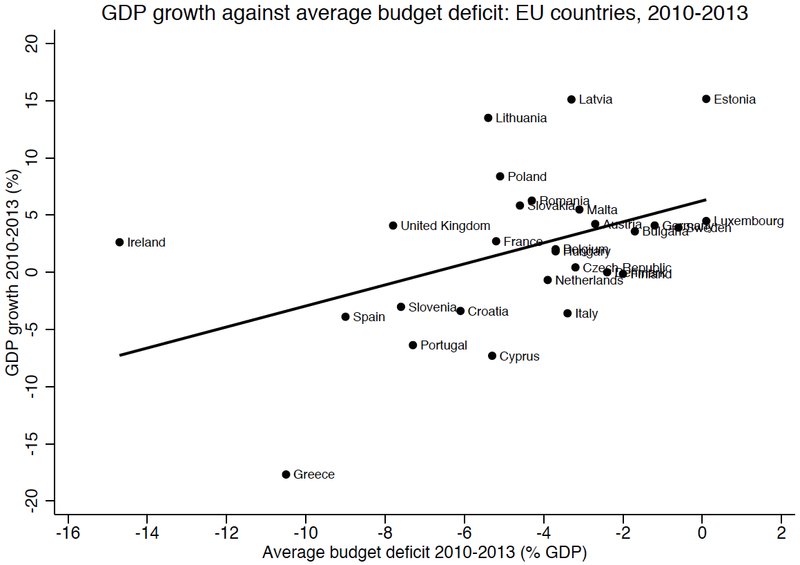 Or in other words, countries that happen to be growing faster can better afford to reduce their budget deficits. Overall, methods more complex than simple scatterplots are needed to rigorously evaluate the impact of fiscal austerity on economic performance. Did Charlie Hebdo act irresponsibly by publishing the cartoons? This is not in the slightest to condone the murderers, who must be caught and punished, or to suggest that freedom of expression should not extend to satirical portrayals of religion. It is merely to say that some common sense would be useful at publications such as Charlie Hebdo, and Denmark's Jyllands-Posten, which purport to strike a blow for freedom when they provoke Muslims, but are actually just being stupid. It is obviously true that, insofar as many Muslims are deeply offended by depictions of the prophet Muhammad, and extremists have reacted violently to such depictions in the past, Charlie Hebdo were putting themselves at risk by publishing the cartoons. In the sense that they chose to do something that much evidence suggested would be likely to provoke an attack, they could reasonably be called irresponsible. By analogy, a person who brandished a wad of 50s in the middle of a bad neighbourhood and then got mugged could reasonably be called irresponsible. Importantly, however, to have acted irresponsibly in this sense is not to be blame-worthy or at fault. If a Muslim woman wearing a burqa were attacked by an irate anti-sexist, we would not say she was blame-worthy or at fault, even though she could reasonably be called irresponsible for choosing to wear a garment that some people find deeply offensive. Why does Cameron want the Greens in the TV debates? It would appear that David Cameron has refused to take part in the TV election debates unless the Green candidate, Natalie Bennett, is also allowed to take part. My guess as to why he's done this is that he and his advisors believe that the inclusion of Miss Bennett will serve to split the left-wing vote. The Greens are probably the most left-wing party in British politics, though they evidently appeal more to educated, metropolitan types than to traditional left-wing constituencies such as workers and immigrants. Consequently, if Miss Bennett is allowed to participate, some viewers who would have otherwise voted Labour will vote Green instead, thereby lessening Labour's chances of securing a majority at the next election. In light of the tragedy that occurred in Paris yesterday, I thought I'd share some of my favourite quotes about free speech. It is important to remember, of course, that we do not have free speech in the UK. In addition to the censoring of films, video games and comedians, individuals are frequently arrested for posting offensive content on Facebook and Twitter. "If all mankind minus one were of one opinion, and only one person were of the contrary opinion, mankind would be no more justified in silencing that one person than he, if he had the power, would be justified in silencing mankind." "We can never be sure that the opinion we are endeavouring to stifle is a false opinion; and if we were sure, stifling it would be an evil still." 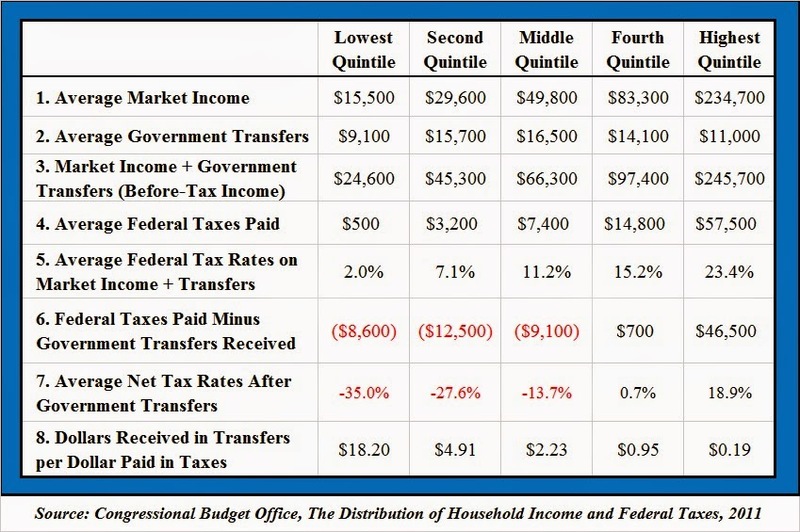 Do immigrants have a positive or negative fiscal impact? Immigrants have all sorts of effects on a society. Here I just want to consider their fiscal impact. Proponents of higher immigration, or at least opponents of lower immigration, argue that the fiscal impact of immigrants is positive. Such arguments are usually made on the basis of empirical studies documenting that, on average, immigrants pay more in taxes than they take in public services. Interestingly, proponents of higher immigration tend to come mainly from the progressive left and the liberal right. For example, in Britain, the newspapers most favourable toward immigration are arguably The Guardian and The Economist. It is quite obvious that the fiscal impact of immigrants depends on their characteristics. Immigrants are often highly motivated, conscientious and entrepreneurial. 40% of US Fortune 500 companies--including such giants as Google, Ebay and Yahoo--were reportedly founded by first or second generation immigrants. Yet it is clearly not true that every prospective immigrant is nascent entrepreneur waiting to found a billion-dollar firm. Within any country, there are some people who pay more in taxes than they take in public services, and others who take more in public services than they pay in taxes. This is not a conspiracy; it is the whole point of the welfare state. (Trivially, if a county with zero immigration runs a budget deficit, then the fiscal contribution of the average citizen is negative.) In general, working age people and those with higher skills pay relatively more in, while old people and those with lower skills take relatively more out. Consequently, if immigrants comprise mostly high-skilled individuals of working age, they are more likely to have positive fiscal impact, but if they comprise mostly low-skilled individuals or those of old age, they are more likely to have a negative fiscal impact. There are very few circumstances in which high-skilled individuals of working age will not have a positive fiscal impact. Students, doctors, engineers, athletes and investors nearly always pay more in taxes than they take in public services. By contrast, the net fiscal impact of low-skilled individuals and those of old age depends on the level of public service provision within the host country: the greater the level, the higher the skills needed, and the lower the age needed, for an immigrant to have a positive fiscal impact. For example, if the host country guarantees a pension and healthcare to anyone older than 65, and the average immigrant is a 70-year-old with no assets, his fiscal impact will almost certainly be negative. 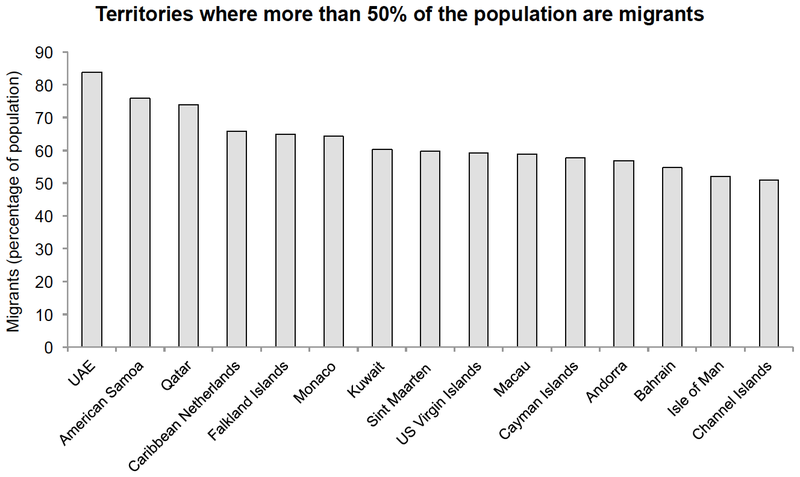 As the chart above indicates, all the territories in which international migrants comprise more than 50% of the population are either oil-rich monarchies or tax havens. In comparison, migrants comprise between 5 and 15% of the population in most Western European countries. The fraction is somewhat higher in Canada (21%), New Zealand (25%) and Australia (28%), three countries that employ both highly selective immigration and guest worker schemes. (Data are from the UN; figures are for 2013.) To my knowledge, no country that takes a substantial number of low-skilled or old age immigrants has what could be described as a universal welfare state. Sweden, which does have a universal welfare state, has taken more than most countries, but evidence suggests that immigration is undermining support for the welfare state there. This is not to say, however, that letting in many more low-skilled workers couldn't improve social welfare at the global level. Earlier I posted about the British and French economic recoveries, suggesting that the UK's has been somewhat better since 2009. My friend Ask argues that it makes more sense to begin the analysis from the pre-recession peak (i.e. 2007) than than from the depth of the recession (i.e. 2009), since one might expect a country that experienced a particularly severe recession (like the UK) to bounce back faster than a country whose recession was not quite as severe (like France). This is a reasonable point. Yet one could argue that it doesn't make sense to begin from the pre-recession peak either, since a country that experienced a particularly severe recession is likely to have experienced a particularly pronounced boom beforehand. For the sake of completeness then, I present some additional analyses. 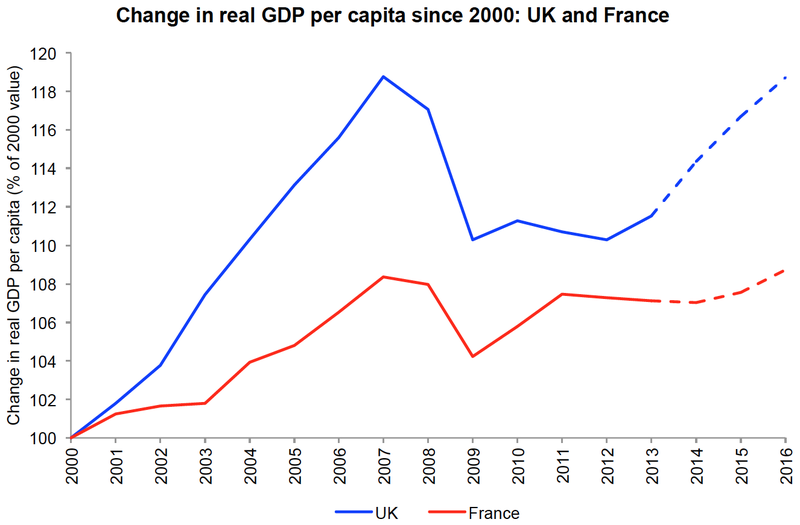 The first chart (below) plots change in GDP per capita since 2000 in the UK and France. And the second chart plots change in GDP. 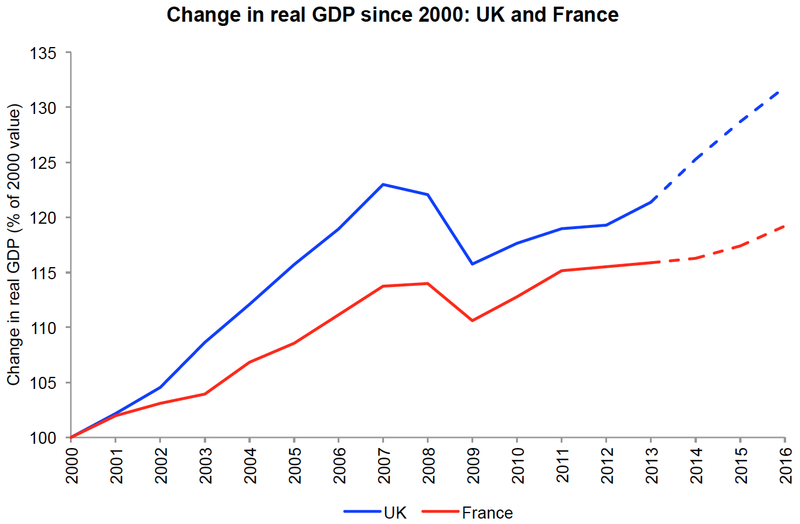 As both charts indicate, the UK underwent a substantially more pronounced boom during the 2000s than France. The single biggest boom year is 2003, when the British economy grew by 3.9%, while the French economy grew by only 0.8%; growth in GDP per capita that year was 3.5% in the UK, and only 0.1% in France. The final table below displays the UK-France difference in the percentage point change in GDP per capita and GDP between a particular start year and a particular end year. For example, the value '7.0' indicates that the British economy grew by 7 percentage points more than the French economy between 2002 and 2014. Overall, the table indicates that the relative performance of the two economies depends on exactly where one begins. 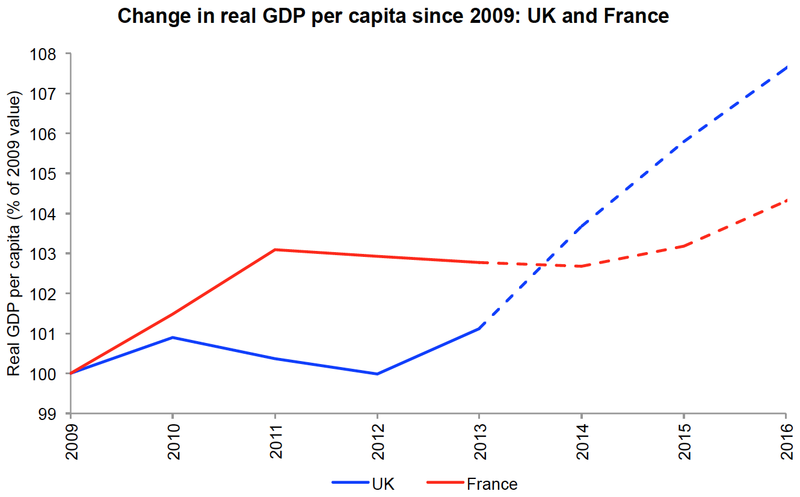 Between 2005 and 2014, GDP per capita grew more in France than in the UK. But between 2004 and 2014, it grew more in the UK. Yesterday, Paul Krugman presented a chart on his blog showing that, since 2007, French GDP per capita has recovered better than British GDP per capita, contrary to some media reports that France is the economy that has been underperforming. While I agree with Krugman that the French recovery has been somewhat better, and the British recovery somewhat worse, than these media reports suggest, I do think his chart is slightly misleading. First, the depth of the recession was in 2009 not 2007, and the UK experienced a much more severe recession (in terms of reduction in GDP) than France. Second, financial media reports are often forward looking: it is instructive to consider not only the recent path of GDP per capita, but also its predicted future path (at least for the next couple of years). As the first chart (below) indicates, when 2009 is taken as the base year, and the IMF's projections for 2015 and 2016 are included, GDP per capita is expected to recover better in the UK than in France. 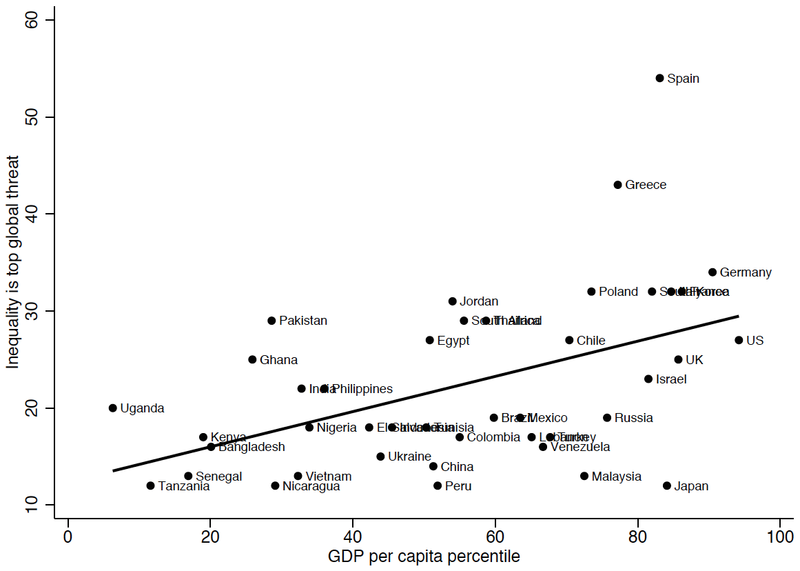 (Data are from the IMF; dashed lines are based on estimates of GDP). Third, while GDP per capita may be the best measure of overall living standards, it is also instructive to examine metrics such as the unemployment rate. As the second chart (below) indicates, British unemployment has fallen since 2009, yet French unemployment has risen. And this is despite the fact that the latter was about a percentage point higher to begin with. In addition, British unemployment is expected to fall further over the next couple of years, while French unemployment is expected to remain high. 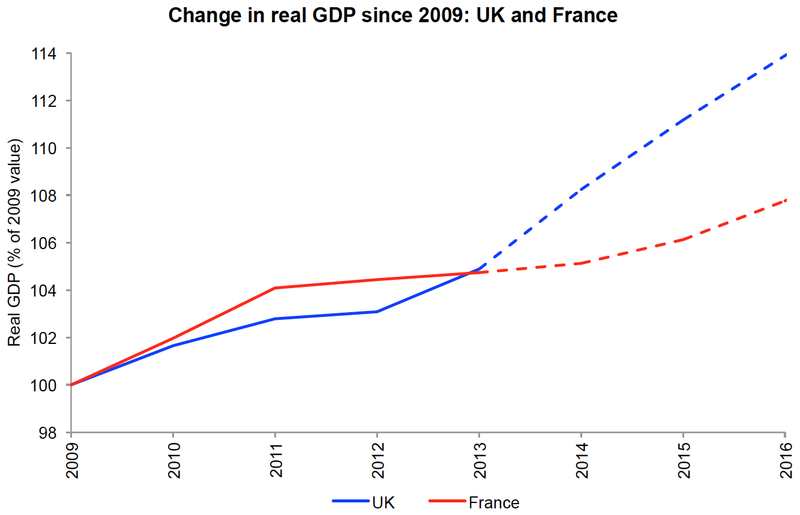 Fourth, as the third chart (below) indicates, total GDP seems to have recovered better in the UK than in France; even by 2013, it had apparently risen slightly faster on this side of the channel. One possible explanation for why the UK's GDP has recovered more favourably in comparison to France's than her GDP per capita is that relatively more migrants with less-than-average productivity have settled in the UK. The arrival of such migrants has the effect of boosting total GDP while reducing GDP per capita. This is a highly speculative conjecture, and might be totally wrong. But it is supported by media reports that low-skilled migrants in Calais are eager to get into the UK. It is also consistent with the fact that the British population has grown faster than the French population over this time period, despite the fact that both fertility and longevity were marginally higher in France. In conclusion, Krugman makes a valid point that some media reports have overstated the robustness of the British recovery and understated the robustness of the French recovery. Yet his chart plotting change in GDP per capita between 2007 and 2014 arguably gives a misleading impression of the relative performance of the two economies since the recovery began. A major caveat, of course, is that the IMF projections I have presented may prove to be largely or wholly inaccurate. Robert Waldmann shows that, in the US, quarterly growth in government spending has been positively related to quarterly growth in GDP since the third quarter of 2009. Yet Stephen Williamson shows that this relationship turns negative when just a few earlier quarters are added to the analysis. Importantly, both Waldmann and Williamson caution that not too much can or should be inferred from a bivariate analysis of ~20 time points. 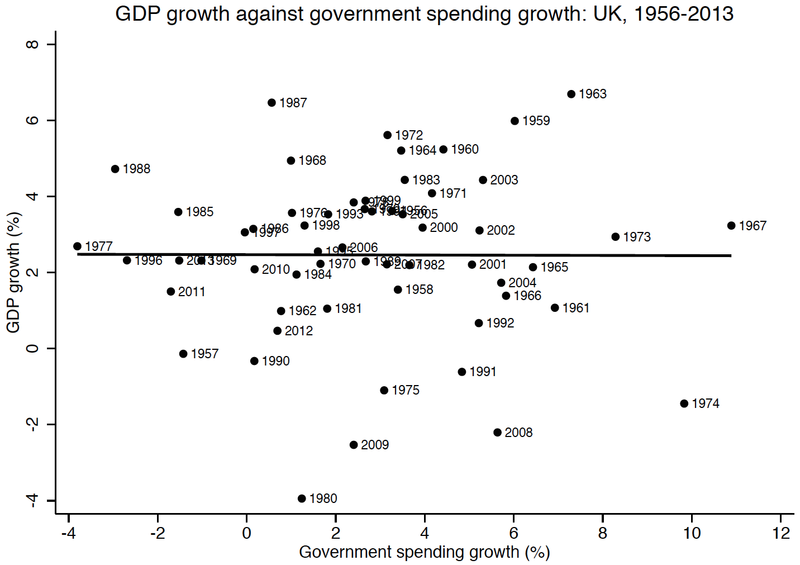 Just for amusement's sake, I thought I'd examine the relationship between annual growth in government spending and annual growth in GDP for the UK, over all 58 years since 1956. Data are from the Office for Budget Responsibility; nominal GDP was adjusted for inflation using the GDP deflator. Interestingly, as the chart below indicates, the relationship is almost perfectly null. Rounded to two decimal places, the regression coefficient is 0.00, with a p-value of 0.98. When using the previous year's growth in government spending, the coefficient is –0.07, with a p-value of 0.45.